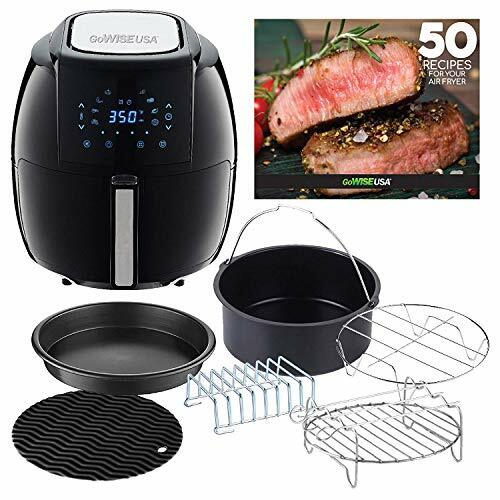 Commercials, infomercials, sales papers, reviews, and online advertisements – you’ve likely heard or seen ads touting what an air fryer can do. Air Fryers are all the rage right now! A few popular news publications are even claiming air fryers are the new Instapot of 2018. Thumbs Up and One Arm Flex! Consider this helpful guide – we’ve done the research for you. We’ll examine reasons why you might consider purchasing an air fryer. Is This Appliance Worth the Hype? How Often Should You Expect to Use an Air Fryer? Where Can I Purchase an Air Fryer? 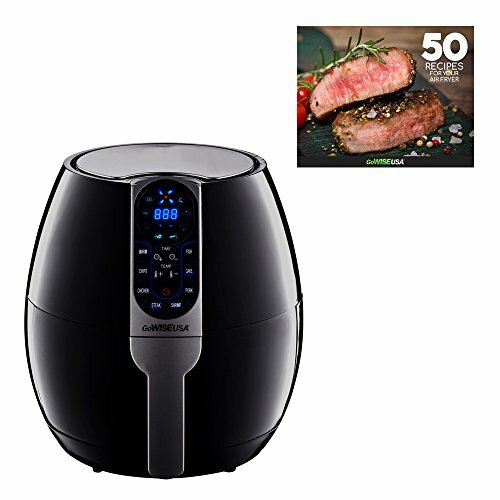 Which Air Fryer Should I Buy? An air fryer is basically a compact convection oven that cooks food rapidly using superheated air. A fan within the appliance circulates the air for even and efficient cooking. This leaves food crispy on the outside while moist on the inside. The result is similar to deep frying but without the excess oil. We believe so, here are 4 reasons you should buy an air fryer. An air fryer will offer you a greater range of functions than a deep fryer. You can use them to heat up leftovers, cook frozen convenience foods, or grill, fry and roast meats and vegetables. They even bake your favorite snacks like muffins, cookies, biscuits, and small cakes. Did you know? Larger models of air fryers can roast a small chicken or turkey or bake a small pizza (typically those 7 inches or less in diameter). Accessory kits expand your air frying horizons even farther. For example, kabob skewers will allow you to roast meats and vegetables kabob style. Springform pans will allow you to bake specialty desserts such as cheesecakes and tiramisu. After a long day at work or during a busy and fast paced day, would you like to reduce your meal prep time by 20 to 50 percent? Using an air fryer, you can do just that. The convection technology utilized by air fryers – the circulation of superheated air – increases the rate at which heat from the fryer is transferred into your food. Thus, you may shave minutes off the cook time of your favorite foods. With an air fryer, you will be able to save time during the cooking process as well. How? Simply set the temperature and timer on your air fryer and walk away. You won’t have to slave over your air fryer as you might your stove, oven, or grill. Instead, you may only have to shake or stir the contents of the frying basket once or twice during the cooking cycle to ensure even crisping. Your air fryer will also save you time when cleaning up, as you will learn below. You don’t need a culinary degree to understand how to use an air fryer. Although controls vary among models, you’ll only need to set the timer and temperature. Most air fryers are typically easy to clean. The frying basket and basket drawer should be dishwasher safe. Various models are noted for nonstick coatings, copper, or stainless steel materials. Each material has its own distinct advantages. Nonstick surfaces, of course, aid in cleaning because they help prevent food from sticking. Residues can then be easily removed during the cleaning process without excess scrubbing. Unlike nonstick surfaces of the past, current materials are designed not to flake or peel and are dishwasher safe. Your air fryer will compliment your green lifestyle. This small appliance is energy efficient, using much less electricity than larger ovens. The faster preheating and cooking times also contribute to energy savings. You will also notice that your air fryer doesn’t heat up the kitchen as conventional ovens do – this leads to additional savings in air conditioning costs during the hot summer months. Have you given up the deep fried foods you love for reasons of health or weight loss? With an air fryer, you can enjoy crispy fried flavors without the fat. Air fryers use hot air and a minute amount of oil to “fry” your favorite foods, leaving them crispy on the outside, yet soft and moist on the inside. This process imitates the chemical reactions, called Maillard reactions, that brown deep-fried foods and make them taste so good. 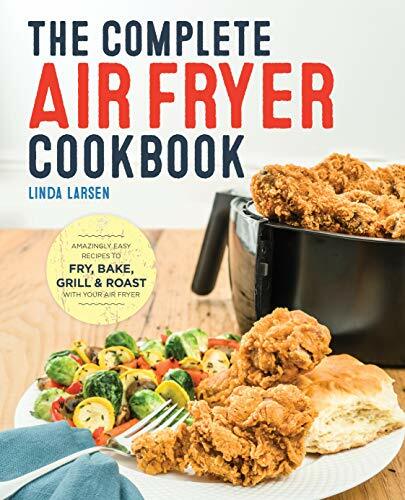 Your air fryer can cook almost anything that can be prepared in a conventional oven, in a deep fryer, on the stovetop, in a toaster, or on the grill. Air fryers are best known for providing a healthier, less oily alternative to deep fried foods, but the options do not end there. Sautee your favorite stir-fry. Make kid-friendly chicken tenders or “fried” vegetables, including breaded cauliflower and zucchini. Trust us, kids will love the bite-sized “fried” flavor! Impress your friends with pub food such as mozzarella sticks, pretzels, or chicken wings. You won’t have to spend big money at fancy restaurants for your next romantic date; air fry a succulent steak or flaky salmon filet instead. The largest air fryers can even be used to bake whole chickens or small turkeys for important family gatherings. If you purchase an accessory kit, your options will increase further. Baking pans facilitate cakes and personal pan pizzas. Specialty pans, such as springform pans, will allow you to make delicate baked goods. With skewers, you can make tropical kabobs that taste as if they’re right off the grill. Many owners report using their appliance at least 3 to 4 days per week. That’s a lot of use – and the convenience of the air fryer will save you time and hassle in the process. Good food and peace of mind – that’s too good of a deal to pass up. In most areas, you can find air fryers stocking the shelves of local retail stores. Almost every Walmart, Target, Kohls, Best Buy, and Costco store, among others, keeps air fryers in stock. Simply head to the kitchen section or ask a retail associate for details. Check out the huge selections of air fryers available from Amazon. You can protect your Amazon appliance purchase with Allstate insurance company’s Square Trade three year Housewares Extended Protection Plan. This extended warranty covers product malfunctions and breakdowns long after the manufacturer’s warranty has expired. All repairs made under the Square Trade warranty include free shipping. You don’t have to feel overwhelmed by the enormous variety of air fryer models on the market today. We’ve assembled the following reviews to help you narrow your selection based on your family’s cooking habits. From tiny homes, dorms, RVs, and economy apartments with limited counter space to simply cooking for one, this smallest of air fryers may be the right fit for you. The Dash utilizes two manual control dials for setting cook time and temperature. The timer has a 30 minute automatic shut off for increased safety. The handle and appliance housing are “cool touch” to prevent burns, and the non-stick fryer basket is dishwasher safe. A manufacturer’s warranty is available upon request. The Dash comes in a wide range of colors to fit any kitchen decor, including aqua, black, grey, red, and white. Non-slip feet give the air fryer stability and ensure that it will stay where you put it. The 1.6 quart frying basket is perfect for preparing about one serving of your favorite snacks. At only 5.7 pounds, the Dash is about half the weight of the average air fryer, making it easy for almost anyone to lift or move around. The appliance is just over 10 inches tall, with a footprint of 8.1 by 11.4 inches. Bachelors, couples, and small families will love this sturdy, egg-shaped air fryer. This fully programmable air fryer has eight cooking presets built in, including Warm, Chips, Chicken, Steak, Shrimp, Pork, Cake, and Fish. The large digital control panel is easy to read. Temperature control ranges from 170 to 400 degrees Fahrenheit, and the timer can be set from one to 30 minutes. The appliance supplies an audible beep to let you know when your food is ready. 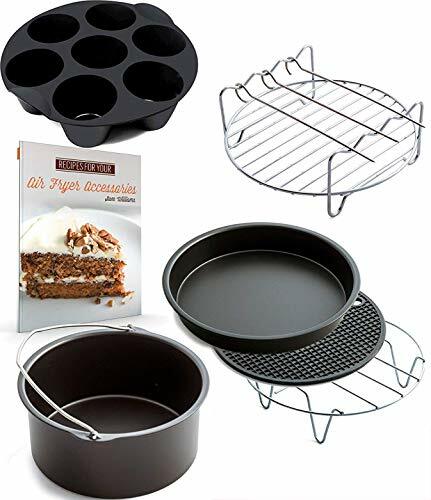 An accessory kit is available direct from the manufacturer, including deep and shallow baking dishes, a silicone mat, an insert rack, a rack with skewers, and a toast/taco stand rack. The large, easy to read digital controls are located just above the fryer’s handle. Controls include an on/off button, buttons to increase or decreasing temperature and time, and eight programmed presets. 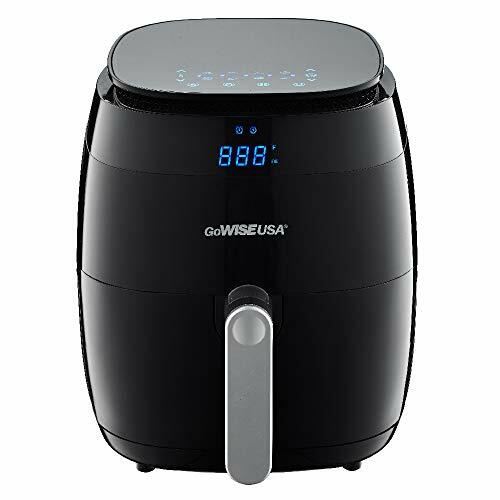 At about 15 pounds, the air fryer is of average weight and easy to lift.The GoWise air fryer comes in three colors: black, white, and purple. This air fryer is 14 inches tall, with a footprint of 11.5 by 12.2 inches. 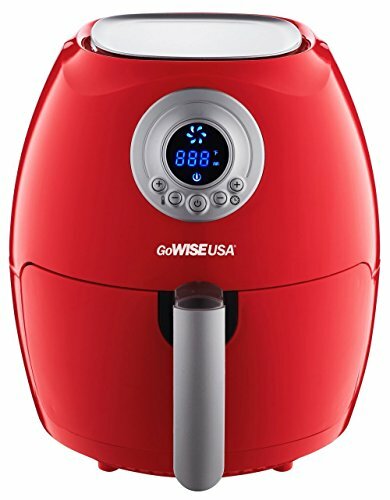 For families of up to four people, a larger version of the GoWise air fryer may be the best choice. This air fryer sports a completely digital touch screen display. Use the touchscreen icons to turn the appliance on and off, set the time and temperature, or select numerous presets, including pork, fries, chicken, steak, shrimp, cake, fish, and pizza. A universal grilling basket is also available. The temperature can be set in 10 degree increments from 180 to 400 degrees Fahrenheit, with a timer of up to 30 minutes. A built in alarm function will remind you to shake the cooking basket contents at five, 10, or 15 minute increments. The cool touch handle of the frying basket has a button guard to prevent accidental detachment of the non-stick pan. The product has a one year limited warranty. This air fryer comes in a wide range of colors to blend perfectly with any kitchen decor. These include black, blush (rose gold), red, yellow, mint, plum, teal, and white. At around 15 pounds, the air fryer is of average weight and easy to lift. It is 13.5 inches tall with a footprint of 12.5 by 11.5 inches. If you’re looking to cook large items or serve a crowd, a compact countertop convection oven might be the right choice for you. Six independent quartz heating elements and a two speed fan facilitate this oven’s convection abilities. Use the simple start/stop button to turn your oven on and off, and make selections on the digital display using the selection knob. Manual knobs are also used to set time and temperature. Simply press the knob to confirm your choice. Available functions include toast, bagel, broil, bake, roast, warm, pizza, proof, air fry, reheat, cookies, slow cook, and dehydrate. You can use your oven with just one rack or up to four. The large cubic foot capacity accommodates turkeys up to 14 pounds, as well as many of the baking dishes and pans that you already own, including Dutch ovens up to 5.5 quarts and 13 by 9 inch sheet pans. The temperature may be set over a wider than average range, from 80 to 480 degrees Fahrenheit. This oven also includes accessories such as a 13 inch non-stick pizza pan, two heavy duty oven racks, a broiling rack, an enamel roasting pan, and a basket designed for air frying or food dehydrating. An optional bamboo cutting board is also available. 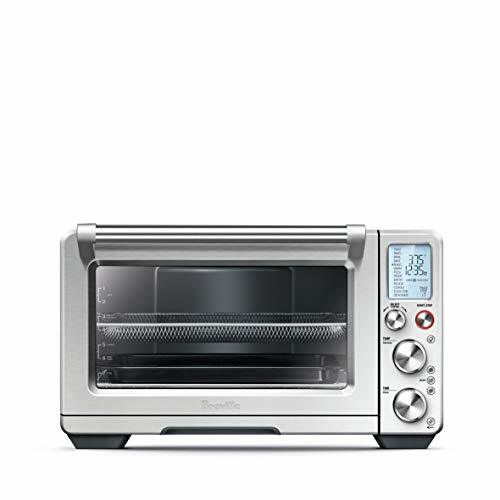 The Smart Oven comes in silver to compliment any kitchen decor. It is constructed of brushed stainless steel. The large digital display located to the right of the oven door allows you to easily monitor temperature, time, function, and phase. The dimensions of this oven are 26 by 18.5 by 17 inches. It is a kitchen heavyweight at nearly 40 pounds. It is often best to avoid products that are new to the market, such as the Chulux electric air fryer. You may notice that it carries limited reviews and is a generic brand. As such, you have no way to judge the quality of the product prior to purchase. New products may boast an attractive price, but it is often better to go with a product that is tried and tested. If a product has limited reviews, no reviews, or predominantly negative reviews, allow this to serve as a “red flag.” Look for longstanding brands you trust, or products with a multitude of informative, positive reviews. Universal accessory kit – allows you more versatility in the use of your air fryer. Universal kits are designed to fit many brands of air fryers; opt for the kit provided by your product manufacturer, if available. Typical kits include deep cake pans, shallow pizza pans, multi-purpose cooking racks, kabob skewers, and silicone heat mats. Oil sprayer – used to lightly coat fresh meats and vegetables with olive, peanut, avocado, or other cooking oils. This misting technique uses less oil than tossing the food in a large amount of oil then draining. Parchment paper – prevents food from sticking. You can either acquire rolls of parchment and cut it to size, or purchase pre-cut circles of parchment meant for use in air fryers. These mats typically have holes punched in them to accommodate air circulation. Do you still have questions about specific models or features? We’re here to help. Post any questions in the comments section below. Love it. Eating fried foods without oil is so much healthier. Easy to clean, cost effective. Great product and easy to use. Tried so many different foods in my air fryer. Would definitely recommend to family and friends, give as gifts. Great for any family, presents for weddings, birthdays, Christmas. Easy to use, clean. Great for small and large families. I love to eat fried foods and with the oil-less fryer, I can eat more fried foods without the guilt of eating fried foods. Only regret is not buying one sooner. Great value for the money and spent a lot of time researching and reading reviews before making my purchase. My air fryer arrived yesterday…. I could hardly wait to open the box! I rushed out to the store to get French fries, that’s the first thing I wanted to make. They turned out perfect!!!! Crunchy and yummy, just like we love French fries. I would recommend this product to everyone based on my first experience alone and cannot wait to make more recipes. Thanks a million :). 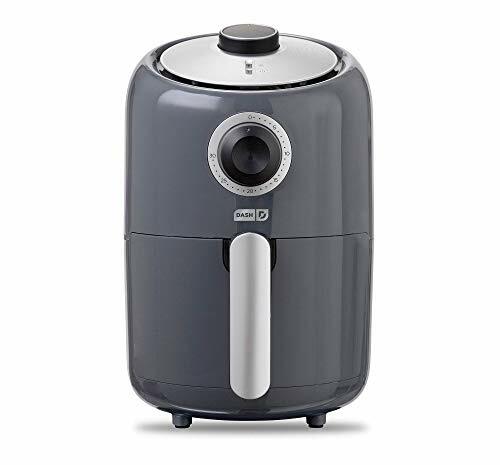 Love the airfryer, use it about 4 times a week, cook breakfast casseroles, meatloaf, Italian sausage, links and bulk, pork tenderloin, grilled cheese, chicken breasts etc, it makes cooking dinner a breeze. I love everything I cook is oil free cooking. Loved before but even more now that my husband recenly had a heart attack and is on a healthy heart diet. So easy to fix meals he can have. I have convinced my kids and grandkids that they all purchased also. My siblings have too. My grandaugher says I should be a salesman for them cause I love sharing recipes with them all I plan to purchase another one so I can cook more than one thing at a time. We love chicken and fish and with the airfryer we did not have to give up our crispy fried meats. Baked potatoes are so delicious in the fryer. The skin is golden crispy so good and nutritious to eat. My daughter works long hours so we taught her 14 old son how to use so he can prepare hus frozen meals with out using oven. I absolutely love my air fryer. It makes cooking so fast and easy. I have a complete meal cooked in under 30 minutes. I love the fact that I don’t have a pan full of stinky grease on my stove and splattered all over my kitchen. My whole family owns this air fryer and love it. This air fryer comes pre programmed with times and temperatures for a handful of popular foods. I would highly recommend everyone purchase an air fryer. I bought he larger 5.3 quart and really like how much it holds. I received this as a gift and absolutely love it. It makes cooking dinner so easy! I love to cook steak, hamburgers, French fries and veggies in my air fryer. My children, who are usually very picky eaters love everything that comes out of the air fryer. They are even eating all of their veggies now! I have been able to make a lot of different recipes and they all come out so crispy and flavorful with very minimal oil. I love how fast everything cooks in the air fryer. The machine is also very quiet and very easy to clean. I love it!! I bought one the cooks essential first I thought about one for a long time then about 1 month later I bought the other one. I love them and use them use them sometimes 4-5 times a day I use them more than any other way of cooking. I love the idea of no or little grease but the great taste of fried foods. I have boiled eggs and scrambled them also made fry pies many kinds of different types of meat and sea food. The list goes on and on I would be lost without my air fryer. I had to share and bought one for both of my daughters and they and my granddaughter use them a lot also. I am going to try baking bread next can hardly wait to see how it turns out. food tastes so good cooked this way. I love the crispness of many of the foods like potato skins oh so good!!!!! I guess I just can;t find anything bad to say only just how great an air fryer is. thank you who ever started making these. lv them!!!!!!! It cooks evenly. We make everything in it! We use Very little oil and comes out crunchy. Super easy to clean. Even tho it has preset options i never use them, i use it instead of my oven. Its faster than an oven. Easy to clean, easy to use. Perfect basket size. I tell all my friends to buy it. Bought mine after a friend was talking about hers and how well it made french fries. Love this… i have made the best chicken we’ve ever had.. only issues are sometimes you can’t slide the basket back in, just take it completely out and start over works everytime! Also under the basket is starting to peel and the basket has scratched a bit. Love my airfryer… we are having a blast experimenting with the many possibilities! As stated makes the best chicken without the guilt! Only regret is not buying one sooner.. i tell anyone who will listen how amazing this thing is! My AirFryer cooks any frozen fried food beautifully. They come out crispy on the outside and juice on the inside. I love that I can adjust my temperature and time but it is also nice to have the preset menu. I use less oil sometimes all it needs is a mist of oil. Being Filipino, I needed to learn how to make crispy fried lumpia in my Airfryer and all I had to do was dip each in oil and put them in the airfryer. They came out crispy and I all it took was pressing a few buttons and waiting until it beeped. I am excited to learn how to cook other dishes for sure! Also, the baskets fit my dishwasher perfectly or if I’m in time crunch washing them is super easy. Its easy to clean and easy to operate.The only problems is the air vent its hard to clean.If its not clean after every use it will get smoke easily.Since we have our air fry we don’t use our oven that’s much.We eat healthy and less time for cooking meals for our family.Its not taking up much space in our kitchen bench and its easy to store in the pantry. Not only that it is so useful on road trip on a caravan no mess less space.I recommend it to my families n friends and they looking to buy one as it is so easy n quick for cooking snack like chiko without the oily taste that I get from takeaway. I was hesistant at first when I bought my airfryer, but was glad that I did. I cooked tofu, springrolls and even muffins with no/less oil. It was wonderful and cleaning was a breeze. I love my airfryer! I’ve owned this air fryer for about 6 months. I purchased it at Macy’s on sale for 25% off thinking I must have gotten a really good deal right. Now being more of a seasoned air fryer pro I definitely think I could have gotten something better with a little more research. My biggest surprize has been how fast an air fryer cooks various foods and how much more convenient cooking is. My intention of the air fryer purchase was to eat healthier and since it didn’t require any oil. Let’s just say that plan backfired quite a bit, I just ate twice as much because everything I cooked was so so good. Some of my favorites foods to cook are sweet potato fries, chicken tenders, and chicken wings. I experimented with making low carb fried chicken with pork rinds and it was amazing. Now onto the actual product review of this black and decker air fryer. This air fryer is only 2.1 quarts so the most you can put in it is probably less than 12-14 oz of food. After 6 months of cooking the basket was weighed down so much it now barely sits a few mm’s from the bottom of the pan that holds it. The quality of this air fryer has been lackluster and below you will find some of my biggest complaints. – I dropped the basket once and it bent the outer plastic of the basket holder so it didn’t fit quite perfect anymore. I know was clumsy but you have to figure something that cost $100 dollars could sustain a little drop. If you have a family or cooking for more than one definitely go for at least 5 quarts minimum. I should have purchased a much bigger air fryer from the start. My next air fryer purchase will be a Philips Air Fryer XL. I have it and like it. I’ve cooked gigantic chicken breast in it twice, messed up the first time because I didn’t cook long enough. Cannot really go by the preset times, learned a lot from Facebook groups and a friend who had been using one for a couple years and owns 4 don’t all me why. But ut the second time it was the best chicken I’ve ever tasted. So good. Tonight I did a bunch of seasoned shrimp whew! So good in about 10 minutes, again, not with presets. I wish I had waited to get the Christmas sale prices and that it came with accessories but nothing to complain about thus far. I bought an air fryer XL. Absolutely love it. I have cooked homemade fries, cod, calamari, and clams. I have had the air fryer just over a week. Very easy to clean. I am going to try something new every day.